It was a perfect Autumn afternoon. The clouds had parted and there were pockets of blue skies and warm sunlight. The air was crisp, but enjoyable with a rhythmic gentle breeze that would softly place the brightly colored leaves before me as I walked. Like my very own red carpet rolled out for me. I’ve been taking these walks as often as possible. My intention being that I can get some exercise in for my body and release some pent up feelings to relieve my mind. I’ve been frequenting the same park the past few weeks and have half expected someone to report me to the police for talking to myself, which I often do as I try and get myself out of the mental rut I’ve found myself in that day. Sometimes in the midst of the steps and complaints I hear the Lord speak to me. That’s what happened to me yesterday. As the leaves spread out before me I smiled. Admittedly, my first thought had not been a movie star’s red carpet, but rather Jesus’ triumphal entry into Jerusalem. As He rode into the city, the crowds began to throw down leaves (not my Autumn colored leaves, but Palm branches) and coats before Him with shouts of praise. “Hosanna!” they shouted. This word– Hosanna– had been used in the Psalms as a plea. Please, save me! Yet, in this context it’s used differently. It’s used as a praise of thanksgiving for salvation. Jesus would bring them the help and salvation they needed, but it certainly wouldn’t look like what they had thought or hoped. The people longed for political salvation, but Jesus would bring a freedom much more life altering. This triumphal entry, in fact, did mimic the type of parades that would accompany military victories. These celebrations would usher in the commander that led the troops in victory. It was their moment to soak in their success and show off the spoils of war. In modern terms, it’s like a victory lap in NASCAR. I’ve been told by my own resident NASCAR expert (since I know absolutely nothing about the sport) that the winner gets to take a lap around the course as the fans cheer and general merriment ensues. It happens after all other 500 laps have been successful completed. Makes sense. You can’t celebrate a victory until you’ve won. Jesus, though, took His victory lap before He went to the cross. Before the relentless scourging. Before the devastating betrayal. He took it before the battle had really even begun. In all honesty, I don’t feel equipped to bring this type of encouragement to you. As someone feeling battle weary, broken and drained, most days I’m mustering every ounce of energy just to hold on. But maybe that’s you, too. Maybe you’re dealing with the loss of a parent or loved one and you wonder if the pain will ever stop. Maybe you’re walking through chemo treatments and the side effects don’t seem to be letting up. Maybe you’re grieving your life/marriage/ministry and how it doesn’t look like what you had imagined long ago. Whatever you’re facing, you don’t see victory yet. 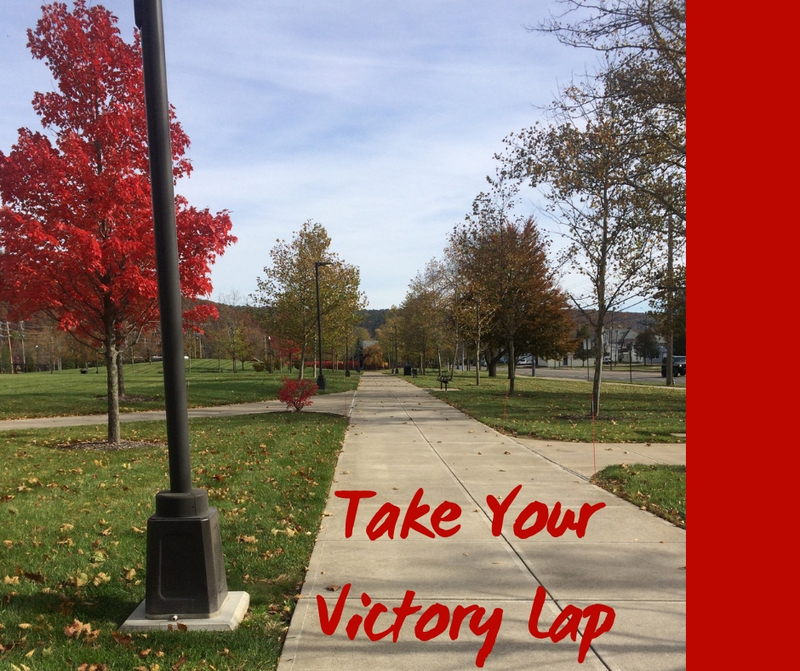 It’s there where I want you to take your victory lap. I know it doesn’t make sense. I know it seems silly. As Christians, we know that we’ve received victory through Jesus (1 Corinthians 15:57). He’s already given it to us and yet we still face our battles. Not fighting for victory, but from it. It may not feel like you’re victorious, but you are and it’s the moments you don’t feel it that you’ve got to walk in the Truth of it. If you don’t have a crowd of fans, know that I’m here cheering you on. Keep on going. Thank you for the encouragement today!